The most sociable creature hitherto discovered in the Lower Devonian Rhynie chert, the small crustacean Ebullitiocaris, comes seldom alone but seems to feel more comfortable in the crowd, grazing on alga layers . A smaller number of mites have been found huddled together within an empty sporangium of Aglaophyton, apparently feeding on the inner wall . Quite differently, trigonotarbids are assumed to prowl alone through thickets of the humble vegetation of that time  or to sit in the empty sporangium watching the flock of mites as they feed and grow unawares of the predator lurking behind them, and eat one of them every now and then . Also there is evidence that they prefer sheltered places for moulting as, for example, a hollow straw of Aglaophyton (Fig.1), where not rarely more than one moult is seen . 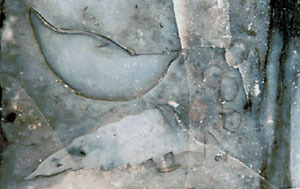 Fig.1: Moult parts of trigonotarbid, probably Palaeocharinus rhyniensis within a hollow straw of Aglaophyton (photograph by H. Sahm). 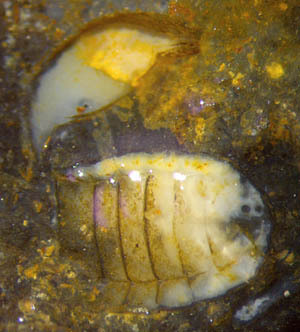 body cross-section, 2mm wide, and legs (above left). 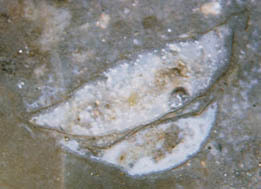 Part of the inclined section of the poorly preserved tube, width about 5mm, is also seen. In view of their solitary way of life, one would hardly expect to see two trigonotarbids incidentally at the same place in the chert. Hence, the below pictures suggest that they came to the place on purpose, perhaps for moulting or mating. arranged unexpectedly close to each other. Apparently the aspect of the sections does not allow easy conclusions to be drawn as to whether they represent the moult or the creature entombed as a whole. The incomplete longitudinal body section with separate leg sections in Fig.2 suggest that at least this one is a mere moult. Although the upper section in Fig.3 is apparently more tilted and thus cannot immediately be compared with the section below, it seems to belong to a specimen bigger than the one below. This could possibly be an indication of sexual dimorphism. 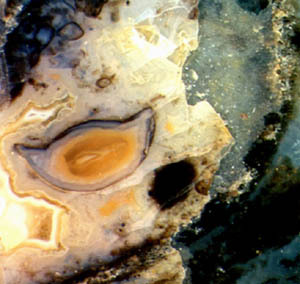 Fig.4: Two trigonotarbids in Rhynie chert: top view (width 1.75mm) and inclined cross-section (width 2mm, corrected for inclination) on the raw surface of a chert layer fragment. The trigonotarbid in Fig.4 (below) is not a section. It is preserved in its true 3D-shape owing to the crack which had separated it from the embedding rock, except for the end on the right where part of the body got lost by spalling fracture. The segmentation of the body is exceptionally clearly seen. The above images seem to indicate that if there are two trigontarbids in one small sample, they are more likely seen close together than far apart. It has to be checked whether this is a rule or merely incidental. Hence, one should look for more paired trigonotarbid sections with the aim to find out some indication concerning the behavior of these early terrestrial predators.